I love Bangkok, so much so that we are moving there later this year. 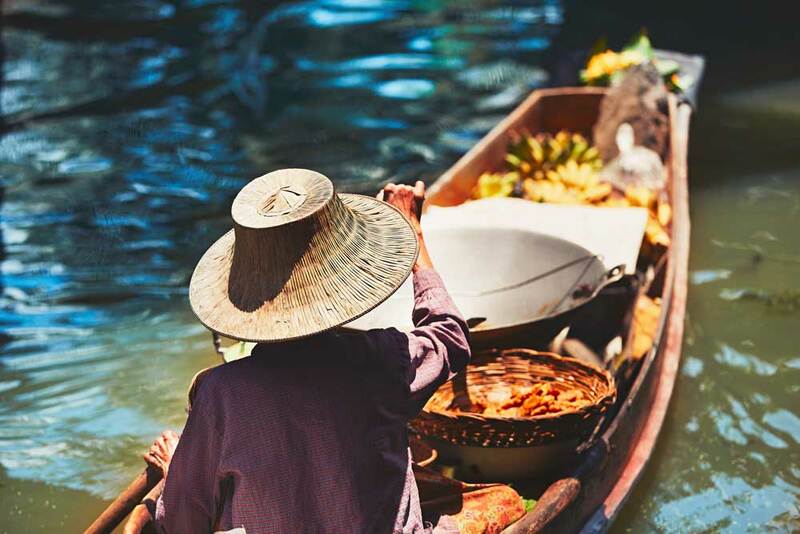 We have had a few different experiences staying in various areas of Bangkok but today I wanted to share with you where to stay in Bangkok with contributions from Bangkok expats and experts. On a visit to Thailand, we had planned to stay in Bangkok for about 4 days and explore its Buddhist temples and generally soak in the culture. 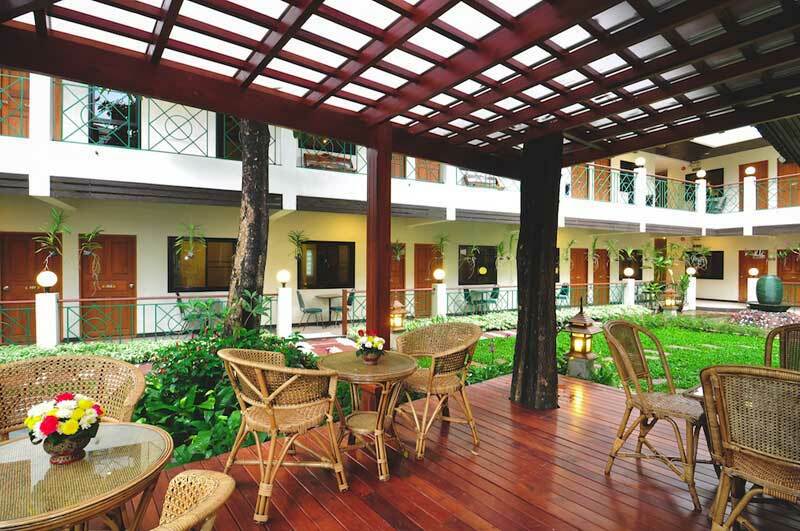 We were looking for a decent hotel to stay which would not only be budget friendly without compromising on quality, but also a place that would provide us easy access to the different attractions of the city. We zeroed in on the Hotel ibis Bangkok Sukhumvit 4, a 3-star property which was centrally located and comfortable and decent without too many frills and complete value for money. The place is very near to many shopping malls and restaurants and is also close to the BTS Nana station. The hotel also runs a free shuttle service to the station. We found the rooms neat and great to sink in after the day’s exploration of Bangkok. In a nutshell, the hotel did full justice to the Accor and Ibis brands, providing complete value for money. Among the elite high-rise hotels of downtown Bangkok, The Okura prestige is one of the best. It’s a Japanese-run hotel group that found a home in this Thai city, celebrating tradition and elegance in every corner. The rooms have plush king beds with floor-to-ceiling glass offering great vistas and ambience. The best spot on the property is the infinity pool, especially at night overlooking the skyline. You can wear your kimono-style robes down to the water. The next morning indulge in a massive breakfast at Up & Above, including western dishes and a full, fresh noodle soup bar. 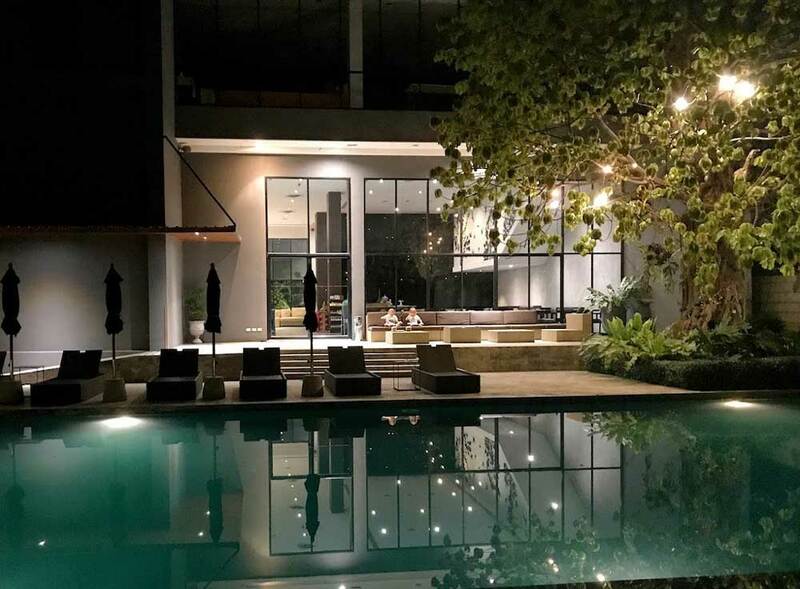 When we were looking for a luxury hotel in Bangkok, we first found many big hotels and resorts but thanks to a tip we found Chakrabongse Villas. Chakrabongse was built in 1908 for a Thai prince, Chakrabongse. Nowadays his granddaughter lives in the main building but there are 4 suites in the garden and 3 rooms in the main building available for guests. 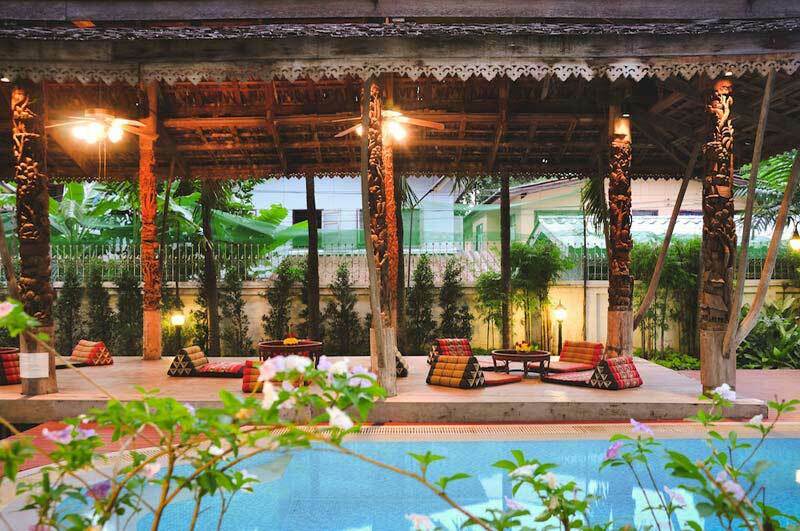 Chakrabongse Villa is nestled on the banks of Chao Phraya River and lays in an amazing tropical garden. Once you enter the gate, you leave the hustle and bustle of Bangkok behind you. There’s only silence over here. We rented the Pool View Suite, which is perfect for families. It has 2 bedrooms, 2 bathrooms and a big living room. Every room is decorated in Chinese and Thai style. The hotel also has a room that overlooks the river. It has an amazing view, but there is a lot of noise from the passing boats. So if you like your rest, I wouldn’t choose the River View Suite. The small restaurant is situated in an outdoor pavilion beside the river. There is no breakfast buffet but you have to order your breakfast the night before. I can highly recommend the Thai Rice Soup. But if you prefer eggs, fruit or croissants, that’s also possible. The location is superb, right in front of the Wat Pho Temple and the Royal Palace. On the other side of the river, you will see Wat Arun. On top of that, there are many good street food stalls at walking distance. The hotel has its own speed boat and longtail boat. Both can be rented for excursions. If you are looking for a luxurious stay, I highly recommend, Chakrabongse Villas. 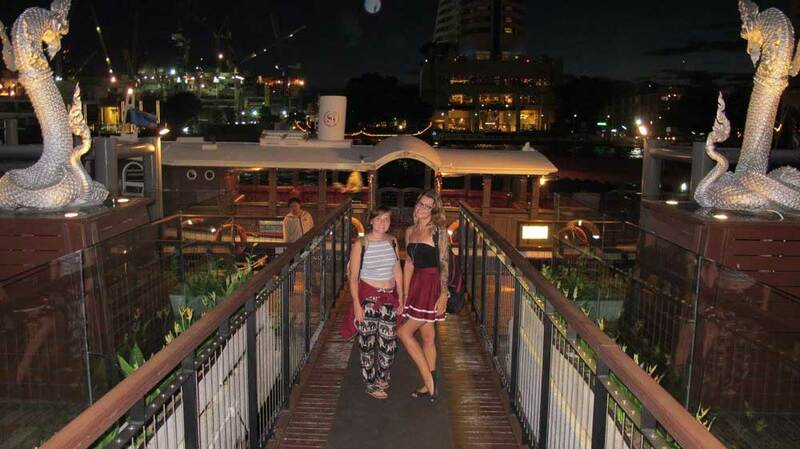 We visited Bangkok several times, and almost every time we stayed in a different part of Bangkok and a different hotel. But one hotel we did come back to was the Visma Ya Suvarnabhumi. It was convenient as we had connecting flights in Suvarnabhumi airport and VismaYa is just 10 minutes away. Visma Ya hotel has a modern design, and the room has a free-standing bathtub. There is an excellent swimming pool, and the breakfasts are good too. It’s not difficult to find such qualities in Bangkok hotels, but this one has one more advantage – it costs only $35 per night. We stayed there the first time when we had an overnight layover on the way to Chang Mai. We liked it so much that next time when we had connecting flights to Krabi, we booked the trip out two days later. 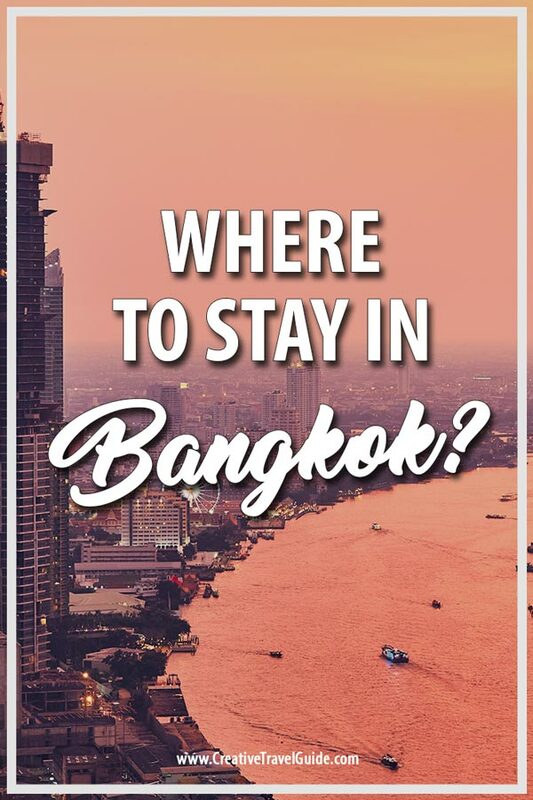 That way we could enjoy the hotel and visit Siam Park City which is one of the best things to do in Bangkok with kids. If you ever have a long transit or early flight from Bangkok – this is the place you should stay. Taxi to the airport costs 150 Baht($5) or the Hotel has a shuttle bus which goes every hour and costs 80 Baht ($2-50). Looking for a little luxury before I headed off on a backpacking adventure, I decided to stay at Royal Orchid Sheraton for 4 nights. From the minute I walked in the lobby I was feeling pretty smug about my brilliant decision! It’s a little out from main attractions but provides a free shuttle boat to the nearest metro station (5 minutes away). The rooms were incredibly spacious, spotlessly clean, modern and came with all the usual extras like robe, slippers and toiletries. The pool area overlooks the river and the buffet breakfast is one of the best I’ve had on all my travels. The evening buffet was incredible and I managed to swing a pretty good deal. I arrived late to the hotel and felt the buffet was a little pricey just for the hour I had left before they closed. I was about to walk away when the friendly staff offered me a 75% discount. The poor man must have regretted it when he saw how much food this scrawny looking girl can put away in under an hour!! Rate: A standard double room cost me about 140USD or 4465 THB per night and, in my opinion, was excellent value. 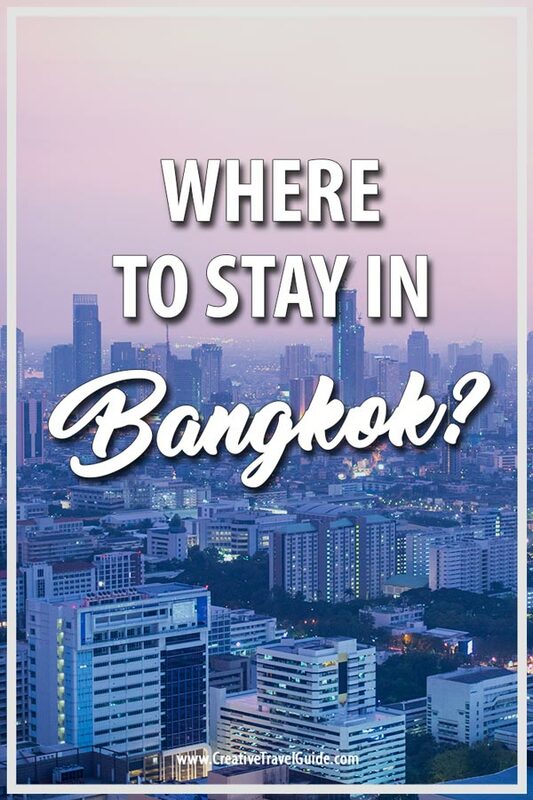 On my next trip to Bangkok, I’ll definitely stay again. When we went on our babymoon in Thailand, the start and end of our trip was in the golden city of Bangkok. Based on research and reviews we chose Charlie House Pinklao, a supposedly hidden oasis with a garden and even a pool. And let me tell you, it did not disappoint! The lodging was beautifully set in a lush green garden with lots of colourful flowers. A small pool allows you to cool off after a day of sightseeing and the Thai pavilion is the best place for a relaxing massage ($ 10 for 2 hours!). Breakfast is not included but you can order a couple of things varying from toast & marmalade to a traditional Thai breakfast. Lunch and dinner options are available as well. As it is situated at the end of a tiny authentic alley (a bit dingy but we’ve never felt unsafe! ), there is hardly any traffic noise. A shopping centre, a big supermarket and a night (food) market are all close by. 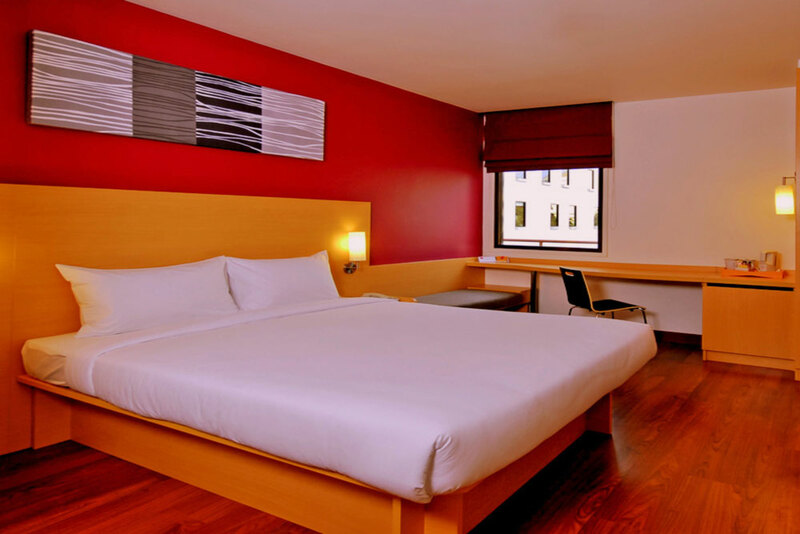 The city centre is a little further, but only a 5 to 10-minute taxi ride away. Keep in mind that it is still budget accommodation, so the rooms are clean but basic. The beds are hard, but that’s common in Thailand (we’ve only encountered 1 great bed on the whole trip). Rate: The classic room will cost you around $30, depending on the season. My husband and I stayed at the Prime Hotel Central Station during our last trip to Bangkok. We chose the hotel based on its location and affordable price, and it honestly exceeded our expectations. Located just on the opposite side of the Central Station, this hotel is a few minutes walk from Wat Traimit; the temple of the golden Buddha. It’s also a short walk away from the China Town’s gate, and obviously Bangkok’s China Town district. 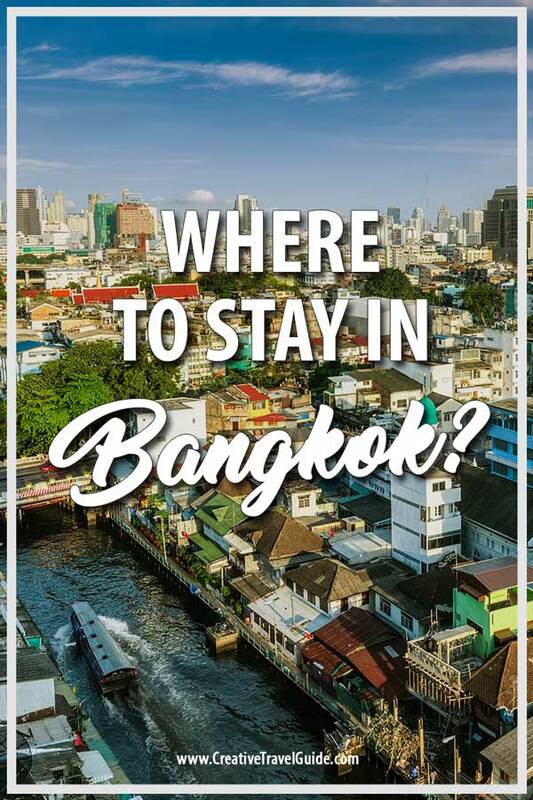 It’s perfect for those travelling by rail, and it’s well connected to all areas in Bangkok as it’s within a walking distance from the MRT station Hualumpong. The hotel starts on the 10thfloor, and you get beautiful viewpoints on floor 12 and 14 overlooking the golden Buddha temple and the busy city of Bangkok. The room was very comfortable and clean. The price is quite affordable, the nightly rate is around £45 ($60), and includes a buffet breakfast, a welcome drink, and a 30-minute massage at the hotel’s spa. The massage was one of the best that we had in Thailand. We did a whole review on the X2 Vibe Bangkok but to summarise, the hotel is a modern, clean and comfortable hotel offering all the amenities you would expect. The hotel is small so the hotel and pool area was often quiet. The location is what makes this hotel perfect. Found in the residential area of On Nut, the hotel is a short walk from the BTS line and is surrounded by local markets and bars and the vibe is more relaxed and chilled out than areas in the city centre. Rates: Starting prices are $40. Thank you so much to everyone who contributed to this post. We can’t wait to check out these hotels when we are next in Bangkok! This will be so useful for when I go to Bangkok later this year! Going to pin it for later so that I can come back to it… thank you! Oh, this is excellent. I have no doubt we’ll be back in Bangkok at some point and will be using your guide. Thank you for covering a range of budgets and not just the luxury places. Excellent article!